Online network marketers pay attention! I want to show you in this SEO PowerSuite Review how I’m using the software to troubleshoot and improve my ranking for the keyword phrase “top network marketing companies”. 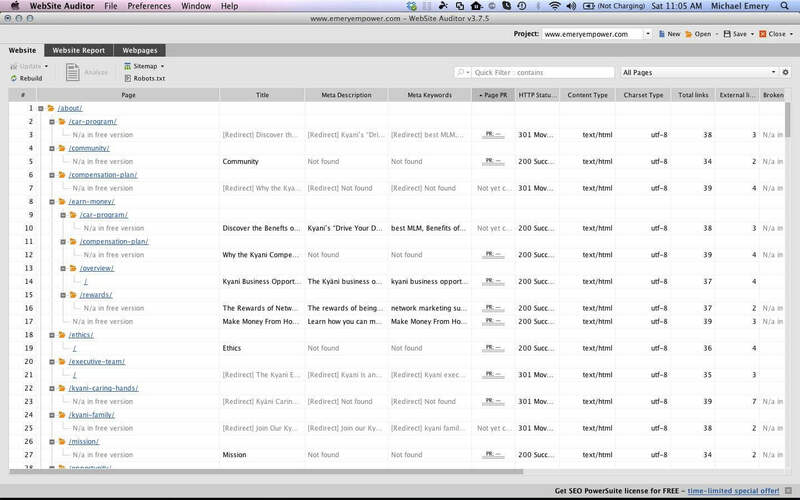 In case you aren’t familiar with it, SEO PowerSuite is the all-in-one SEO software program for Mac, Linux and PC! If you understand the power of internet marketing plus network marketing and own one or more websites that you want to drive high quality targeted traffic to then you need to seriously consider using SEO PowerSuite. It does not matter if you are a complete internet NOOB (newbie) or a season search engine optimization professional, the SEO PowerSuite software has the tools that quickly and efficiently gather the data you need to make informed decisions. Perhaps you are a blogger, a marketing manager, a one person team, or perhaps even work for online network marketers… You understand the importance of targeting your precious time and using every moment as wisely as possible because time is literally money. When it comes to having an online presence, even the slightest of factors surrounding SEO, social media and internet marketing all play together to affect whether or not your website receives the traffic your organization needs to stay in business. Right now, the majority of all organic site traffic comes from Google keyword searches. If you want to be a serious player in online marketing then you’re going to have to get the tools that will place your sites in front of a torrent of information. This SEO PowerSuite review will show you how an SEO software program can help online network marketers rank for terms like “top network marketing companies” as I am doing in this post. 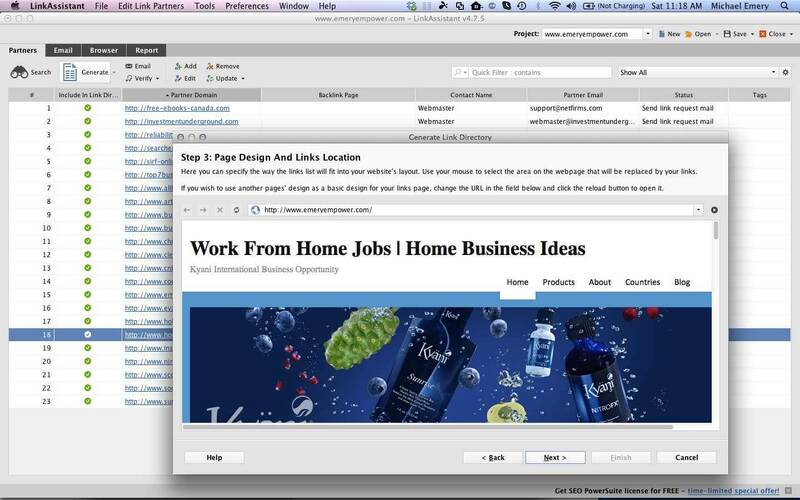 Site quality and structure is becoming more and more important as search engines evolve. In order to achieve top Google rankings, your site has to be completely dialed in and even the smallest of details are now important. Website Auditor will help you to optimize your site at the domain level and also at the page content level. What this means is that every broken link, HTML code error, duplicate content, 404 errors, unindexed webpages, and missing or too-long titles and meta descriptions must be optimized otherwise your site will not hold its position or climb in Google ranking. You may have never considered that online marketing is like a battle as you’re competing for finite rank space. There can only be one number one for any keyword phrase… If you do not know who your competitors are and what they are doing to grow their business presence then you’re eventually going to lose ground to them. Search engines place a tremendous amount of value on links coming from high quality sites. The higher quality the websites that point to your site, then the higher in the rankings you climb for your targeted keyword phrases. SEO SpyGlass is the solution when it comes to analyzing your competition and stealing their backlinking blueprint so that you can push your site to the top. So now that you’ve done your keyword research, chosen the keyword phrases you want to rank for, optimized your site structure and wrote some compelling content, spied on your competitors to see where their backlinks are coming from… Now you need to get some high quality links, right? This is where LinkAssistant comes into play. Time and time again, SEO professionals have said that the best and longest lasting back links are those that are created manually. But who has time to create thousands of high quality backlinks one at a time? 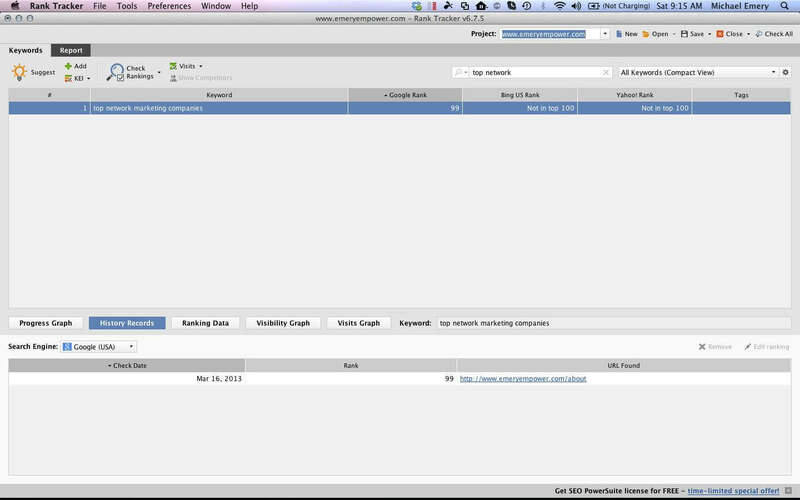 LinkAssistant will automatically find valuable link partners and dig for their contact information, it will generate your own link directory that matches your site’s characteristics, upload this directory to your website, send potential link partners personalized emails and establish reciprocal links. Sound complicated? It is completely on autopilot and search engines love these high quality links. Alright online network marketers, to demonstrate in this SEO PowerSuite review how I used Rank Tracker, WebSite Auditor, SEO SpyGlass, and LinkAssistant to determine what needed to be done to boost this site in the rankings for the keyword phrase “top network marketing companies”. 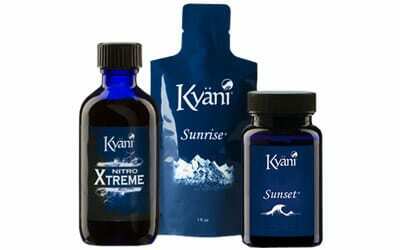 As a Kyani distributor for a health supplements network marketing company, my target market is online network marketers who are actively building their social networks both on the web and offline so I’m actively on the lookout for people who are looking for the top network marketing companies to join. 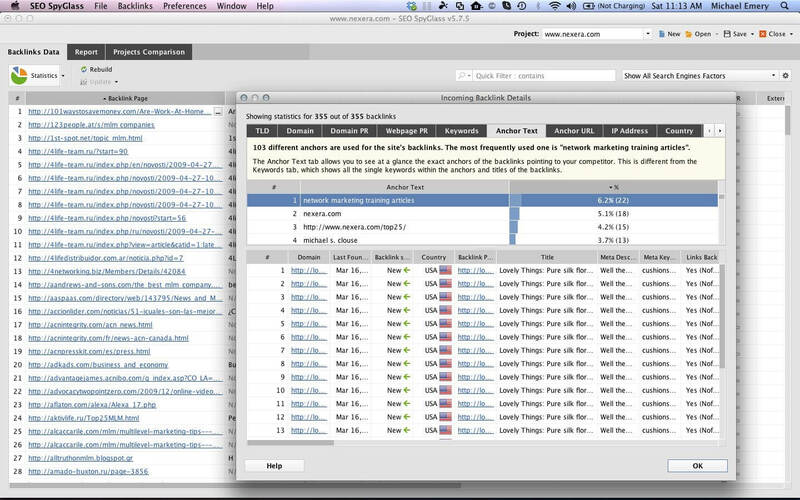 Lastly, for the final step, it is SEO linkbuilding time! I opened up LinkAssistant and let this web tool do its thing. It generated a nice report – a list of sites from various sources with the contact information that I guarantee would have taken me hours to try to find. Now I can choose which contacts to send the link request email and LinkAssistant will effectively take over from there by automatically generating the directory and managing the requests. 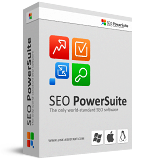 It doesn’t matter if you are the CEO of your own company, part of a team of web consultants, or someone’s assistant, this SEO PowerSuite review shows that this is an optimization program that a serious online promoter needs in his or her search engine optimization arsenal. The comprehensive reports that this software generates allow you to compare data based upon daily, weekly and monthly changes in updates. Sometimes, online network marketers like me trying to rank for keyword phrases like “top network marketing companies” need to make investments in the products that will remove the barriers to success. Potential users of this tool should know that this review is based upon the latest edition as of today’s date March 16, 2013. There is no reason to not try out the software as there is a free download file and it is available for Mac OS, Windows and Linux. If you have considered paying for a rank checker tool and taken the time to compare options you’ll know that the price of this software and its various packages ranging from paid elite to free are a strong player in the competitive SEO software products marketplace. Visit www.link-assistant.com to follow up on my SEO PowerSuite Review and download your free version of this software because as I’ve shown it will work great for online network marketers trying to rank for keyword phrases like “top network marketing companies”.